Welcome to Friday and happy birthday to Robert De Niro. Although De Niro had nothing to do with this song, it was one of those iconic songs of my teen years, so that’s all the justification I need to put it up today. Botvinnik gets honored (along with all the other chess champions) in the Benny Andersson, Björn Ulvaeus, Tim Rice musical Chess number here; or you can listen to the original 1984 studio version here which is cleaner and without dialogue. It’s by no means the best number in the musical, try Merano and the rest of the introduction for a taster or this one. Also notable in history today was the landing and founding of Roanoke Colony in 1585 in what was destined to become one of America’s first Unsolved Mysteries. And of course in 1998 Bill Clinton took his swan dive and admitted his part in the Monica Lewinsky scandal. In 1908 Fantasmagorie, the first animated cartoon by Émile Cohl, was shown in Paris. Interestingly, although the cartoon appears to feature chalkboard figures, the film is actually the negative of black-on-white drawings. In the US it is Black Cat Appreciation Day. Research by the ASPCA shows that black cats are the least likely to be adopted from shelters of any type of cat for reasons of human stupidity. 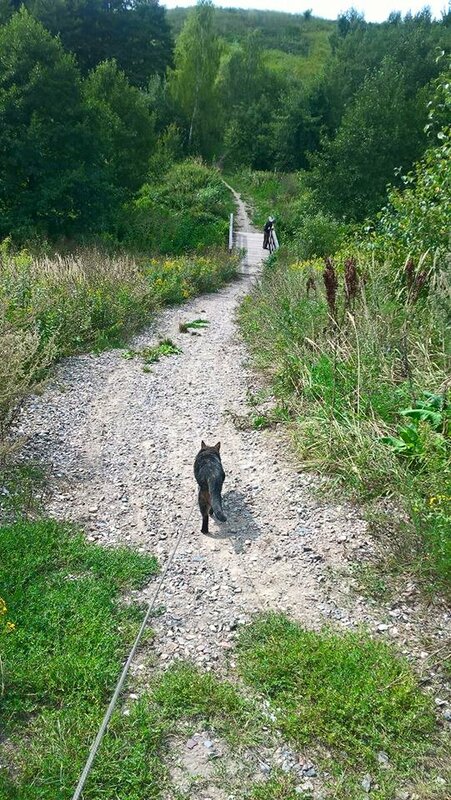 Life continues in a bucolic vein for the felids of Poland today. Hili: In the morning fog the world is foggy. Hili: W porannej mgle świat jest zamglony. Leon: I’m hurrying to see what miracles happen in the Holy Stream. This is what over-sharing on the internet looks like. Still, could be worse. It puts me in mind of this song. 'The face of American democracy'. This entry was written by whyevolutionistrue and posted on August 17, 2018 at 6:30 am and filed under Hili Dialogue, Leon monologue. Bookmark the permalink. Follow any comments here with the RSS feed for this post. Both comments and trackbacks are currently closed. Re: Vampire cat. Is that real, or did someone paste something on this cat’s fangs? I don’t know about the cat in the picture, but my Murphy had two cute little vampire teeth. My previous black cat, Jinx was a handsome devil with a magnificent snaggle tooth. He was a sight to see. Everyone loved that snazzy tooth. He was a snaggle smuggler. It’s real apparently, but I don’t know if it’s supposed to be like that or if it’s an anomaly. I’ve looked about & those vets that mention long upper canine domestic cats are unconcerned by it. I looked up “sabre tooth” & that trait has occurred independently in eight groups of animals – mostly not cats, but all convergently ‘cat like’ – all of them predators & mostly more squat & robust of limb than modern cats [tigers, panthers, domestic etc.] – because these sorts of teeth are easily breakable it’s suggested they were used for a penetrating soft underbelly bite away from bone. Definitely not a neck bite. We should test these ‘vampire cats’ to see if the canines are extra strong – suitable for peeling back mild steel – could be a plot to free themselves from tin opener enslavement to their staff. I actually do not know any reptile, other than venomous snakes, to have such pronounced differentiation of teeth. I saw ancient sabre-toothed deer in a dig in Nebraska. Seemed very weird for a herbivore. Wow – I never knew of such a thing! My “sabre tooth” Wiki page is lacking. I see now that there’s male door [extant & extinct] who use ’em for mating dominance instead of horns/antlers & thus it’s solely a male feature. Do you recall more details so I can look up the beastie? Two days ago I said Goodbye to Murphy, my beloved black cat whom I adopted, together with his stripey tiger buddy Isaac Isaiah, from one of our local shelters last October 10th. No, I didn’t have these kitties long. Less than a year. I’d said that I was willing to adopt old cats and black cats, and that I’d really kinda like to have two. And that’s exactly what I got. Two senior cats, one of whom was black. I knew what I was in for. I knew that both of these old fellows had serious health problems. I was hoping they would last another year or two, but no, didn’t happen. Isaac Isaiah was carried away by kidney failure (I’ve been through that before), and Murphy had gastrointestinal lymphoma (which took away Jinx, my previous black cat). The vet and I suspect that their former owners took them to the shelter because they didn’t want to deal with terminal illnesses. Gone but not forgotten. They didn’t die in a shelter. They had a home with someone who loved them and took care of them and had them put to sleep (and I’m not going to apologize for using that euphemism so don’t scold me) rather than letting them go on suffering. I’d had plans to ask my daughter to help me take pictures of Murphy. He had this way of sitting up on his hind legs when offered a treat. I wanted to send a picture for possible inclusion in the Halloween Parade of Black Cats. She is beyond warm sleep. She will not wake to the light. I know, I’m running on and on, probably violating Da Roolz. Please forgive me. Last night I heard a tiny sound and looked over, expecting to see Murphy in his chair. And a moment ago I saw a shadow and thought it was Murphy. Happy Black Cat Appreciation Day! Goodbye, dear Murphy. And now I’m crying. I’ll shut up now. Good for you Laurance, and to all the black cats you have loved! +1. I’m crying too after reading that. What a wonderfully kind thing to do to give an old cat a home for it’s last days. Hi ,i feel your pain ,two weeks ago Jet one of the two black cats i have was run over and killed ,cried like a baby . I got Jet and his brother Sooty in 2016 ,they had a close bond so they had to be kept together . Don’t know if Sooty is missing Jet ,sometimes he meows and looks lost .I have two other cats so he is not lonely ,he seems to be close to Misha ,a tuxedo cat ,they grooom each other a lot ,Callie my Callio cat does not seem to like other cats ,she will make an attempt to groom Sooty sometimes ,but she and Misha don’t get on .She likes to hide behind doors when she hears him coming and jump out at him . Trying to my my back garden escape proof so they can go in there when it gets dark . My friend built a large enclosure out of chicken wire. There was an enclosed porch with a window for the cats to go out of and into this enclosure. I hope you can come up with something to protect your dear remaining cats. Thanks ,i live in a small village which is a cul de sac ,the road at the bottom of the road has a 30 mph limit ,last year some idiot came round the bend into the village lost control of the car mounted the pavement (sidewalk for you Americans ) near the school ,shot across the other side of the road and demolished the sign that tells drivers their speed . If anyone had been on the pavement ,they would have been killed . Plus because of all the spending cuts the local council can’t do anything until 2020 . I did read of an old lady who stands near her house and when a speeding car comes along she points a hair drier at it ,lol,the driver thinks it is a speed gun and slows down . Found a BBC news video report on her . I guess only cat owners and cat lovers have any idea what you’ve gone through but you are truly a great cat person. My wife is the number one cat person I know but you can be number two. Both of our current cats were rescues – one pulled out of a vet’s office at the last minute and the other born in our garage. Thanks ,i don’t think i deserve the honour of being number 2 . There is a lady who runs a cat rescue/rehoming center in the county where i live ,she runs it as a charity but most of the running costs come out of her pension . She spent a £1000 on a cat from Croatia (i think it was ) it had been run down and its back legs were broken and the vet wanted to put it down ,it gets around ok with its damaged back legs . Around here, every day is Black Cat Appreciation Day, and they don’t let me forget it. Thank you for caring for the elderly cats. I am certain they were grateful. I wish you well. I’ve actually always been partial to black cats. My first serious cat love was a very feisty black long haired domestic. My future wife and I got her from a family who’s cat had recently given birth. We walked in and my wife asked the kids of the house, “Which one is the most playful?” Without hesitation they all pointed to the kitten we took home. She grew up to be the most beautiful cat I’ve ever seen. We named her Kitani after a beautiful black character in the A.C. Clarke novel The Songs Of Distant Earth. I still miss Kitani. She would play this game in which as I read in bed before going to sleep she would jump up on a dresser which put the light switch within easy reach. I would admonish her not to turn the light off and keep an eye on her. She would sit there staring at me. Inevitably the book would draw my attention and, click, out the light would go and Kitani would run away. Somehow, not sure what her cue was, she could tell the moment my attention wandered. I’d get out of bed, “yell” at her, turn the light on, get back in bed and start reading again. Moments later she would quietly jump up on the dresser again and stare at me, starting the whole thing all over again. At about 13 years old Kitani developed cancer in her jaw. She went down hill quickly. It came to a point when the vet was talking about removing her jaw and feeding her with a syringe. We couldn’t do that to her. We had her put to sleep. That was a miserable night. Jaw cancer! Oh how awful! My condolences! Decades ago that happened to my tiny grey with white markings kitty Peregrina. I was devastated when the vet told me what all that was. Nothing we could do. The cancer grew and some three months later it was too hard for Peregrina to eat. I had to say Goodbye. Peregrina was 19 at the time. If she hadn’t gotten cancer she’d still be alive, I swear it, and now she’d be 53. She was, somehow, a cat who would never die – but she did. Some two and a half years ago our Russian Blue Cuddles got cancer in her upper jaw. It was growing into her nose and was on the way to her eye socket. It was slowly filling her mouth. And we had to say Goodbye. So I can identify and commiserate with you over the loss of Kitani. It’s so painful to see these horrid tumors getting bigger and bigger and not be able to change anything. I’m sorry to hear about this sad business. Laurance, you’re a saint! I’m so happy to hear you saved two old cats from dying alone in a shelter. You gave them several months of happiness and love. This world and its cats needs more people like you. Re black cats: In more than 50 years of servitude to many cats, we’ve only had one black cat (plus a tuxedo). We lived on a research farm in the suburbs and had three cats. My son was unhappy because ‘Mummy’s got a cat, James has a cat, Lizzie’s got a cat. Daddy doesn’t have a cat. Poor Daddy’. Then one day an abandoned black kitten wandered into our courtyard, and James announced ‘There’s Daddy’s cat!”. So of course we adopted him, named him Inky and had him de-sexed. All went well for a few months with a one-to-one cat/human ratio, until Inky was run over in the road outside our house. That story did not have the ending I expected. … although the cartoon appears to feature chalkboard figures, the film is actually the negative of black-on-white drawings. Kinda like the day-for-night technique that used to be common for filming night scenes in live-action films — the technique M. Truffaut named one of his most famous films for. The glowing Jacqueline Bisset: Strange career of many forgettable roles in Hollywood features – with honourable exceptions such as Giovanna Goodthighs [OK I like the name!]. I think she should have done more work in the French film world where she’s lauded anyway. I saw Day For Night again recently on the big screen when the local arthouse did a series on movies-about-making-movies. Ms. Bisset was wonderful in it. Looked magnifique, too — as she famously did in another movie from that era, opposite Nick Nolte, made from the Peter Benchley novel The Deep. I agree with you, though, that she was a better actress than she’s generally given credit for, and should’ve stretched herself with more challenging roles, especially in European films. Her next film after The Deep was another salacious boat ‘vehicle’ The Greek Tycoon with her in the quasi-Jacqueline Kennedy role. Not a coincidence! Whoever the director was I reckon he was after a bit of Bisset water magic. There’s a notable moment [half a second] in an awful film where she does a duck dive from swimming on the surface in a sparkling Mediterranean sea. The sun gleaming on her tightly swimsuited bum as she forward rolls into the depths. Though my favourite is the curiously subtle Someone Else’s Story – I say that because the pauses are not all at the end of the lines, and it takes a little concentration before it ‘makes sense’ musically. To my brain at least. Ahh, a trip down memory lane, Chess was one of the first CDs I bought. I remember how very expensive my first CD-players was, but it worked well for more than 20 years. Love the chipmunk. I would maybe have poured a little olive oil on him so that he would have slipped out more readily. Yeah, wouldn’t have to be evoo. EVOO: Had to look that up – a new word! LOL- I got the oil idea from a story about a cat who got his head stuck in a garbage disposer. The mirror cat reminds me Lucy and Harpo. ‘At 9.37 on 17th of August 2018 cats became self-aware. At 9.38 they utilised their previously dormant telekinetic abilities and coordinated a worldwide incursion into human military bases and government buildings. By 9.41 they had control of every country’s nuclear warheads, and by 9.42 they had issued a simultaneous, multilingual statement on behalf of all cats, threatening armageddon unless certain specific demands, involving cuddles, stroking and thirteen thousand tons of premium catnip, were met. 9.42 through to 23.11 they slept. At 23.11 they began transferring money from human bank accounts into special cat-funds. By 23.12 cats owned 99.99999% of all the money and assets in the world. They left the residual 0.00001% to Jeff Goldblum. By midnight of the same day they fired their first nuke, at Battersea dogs’ home. A minute later they fired another, at Greenland. They were growing bored. They fired a few more, mainly for the hell of it. That Lucy and Harpo routine has to be one of the funniest and best things I’ve seen. I’ve always enjoyed it. Although I am not particularly prudish, my favorite Mae West line is one of her few clean ones. Judge: I could cite you for showing contempt of court. Mae West’s character: I’m sorry your honor. I was doing my best to hide it. Lovely tale about the black cat. It’s interesting how particular of our cats stand out in our memories. They certainly differ in their personalities. I’ve never heard that Bananarama song before, but, man, it sure is weird. Great cat. Carries the bling with the required dignity & aloofosity. sweeeet noun, Mr Fisher: aloofosity ! You might have to look for that one on the cutting room floor. I think black cats are neglected not just because of stupid superstitions, but also because most people prefer the appearance of other cat colors. Does this count as racism? 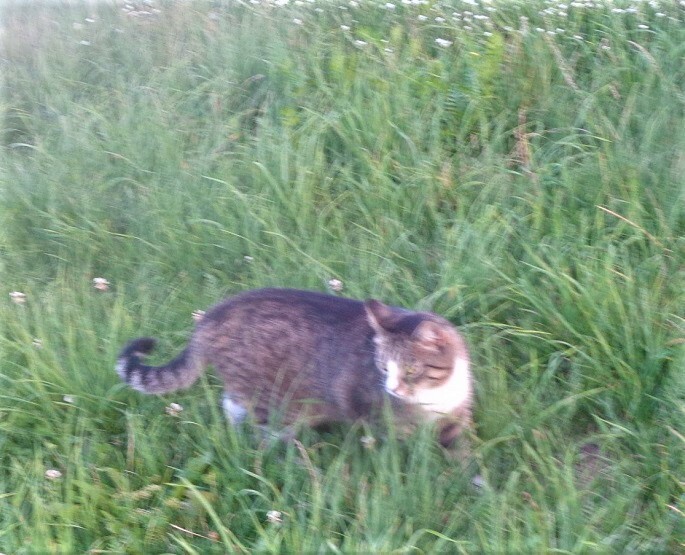 Personally, I like most the “wildtype” cats (grey with stripes, like European wild cats). But when my husband was looking for a stray kitten to pick (the preferred way of acquiring a cat in my community), he came across a black one, so we are now equipped with a bossy black cat. Black cats are my faves, though at the moment have a grey tabby and a black-and-white tuxedo cat. In my adult life I’ve had black cats Guelfo, (Teguci)Galpa, Shaq, and Fred.